1. What is the Performance Management System? It is an organization-wide process to ensure that employees focus work efforts towards achieving DepEd’s Vision, Mission and Values (VMV). Performance Management is a systematic approach for continuous and consistent work improvement and individual growth. 2. What are the objectives of the Results-based Performance Management System? Align individual roles and targets with DepEd’s direction. Track accomplishments against objectives to determine appropriate, corrective actions if needed. Provide feedback on employee’s work progress and accomplishments based on clearly defined goals and objectives. Become a tool for people development. 3. What is the FOCUS of RPMS? The WHAT which refers to results that must be achieved from the Central Office, Regional Office, Division and Schools for the organization to succeed. Strategic Priorities are broken down into Departmental/Functional Area Goals, which are translated into individual Key Result Areas (KRAs) and objectives. Aligning objectives in this way enables individuals and units to contribute to organizational success. The HOW refers to competencies at play when individuals do their jobs. Each employee’s competencies can promote organizational values and help achieve organizational goals. If individuals and units possess required competencies and demonstrate values consistent with strategic goals, the organizational vision will be realized. 4. Is the RPMS approved by the Civil Service Commission and DepED? At the start of the performance period, supervisors and subordinates agree on: 1) Objectives to be met 2) required competencies based on strategic priorities of the organization. Managers create an enabling environment to improve individual and team performance. They teach employee performance and progress towards accomplishments of objectives. Managers evaluate employee performance based on evidences of competencies measured against performance targets agreed during Phase 1. The manager points out the employee’s strengths and weaknesses and gives a tentative rating. The manager and employee discuss performance data and agree on the final rating. This phase is based on the results of Phase 3. The supervisor and subordinate discuss accomplishments and corresponding rewards and incentives. They also discuss competency gaps and jointly come up with a development plan to address these. 5. The enclosure to DepEd Order No. 2, s.2015 was signed by Dir. Lydia Castillo of CSC-NCR. Will the guidelines be applicable to all DepEd Regions? YES, because the issuance was signed by the DepEd Secretary. 6. What are the manager’s responsibilities in the performance planning phase of the process? Review the organization’s vision statement, mission and values and the departmental goals. Read the individual’s job description. Think about the goals and objectives the person needs to achieve in the upcoming appraisal period. Explain how the DepEd competencies will be demonstrated. Determine what you consider to be fully successful performance in each area. 7. What are the employee’s responsibilities for performance planning? Review the organization’s vision, mission, and values and your own department’s goals. Review your job description and determine your critical responsibilities. Think about your job and identify the most important goals you feel you should accomplish in the upcoming appraisal period. Think about what you consider to be fully successful performance in each area. 8. I have never held a performance-planning meeting. How do I get the planning meeting off to a good start? 9. What is the difference between “results” and “behaviours”? Results include actual job outputs, creatable products, measurable outcomes and accomplishments and objectives achieved. Results deal with what the person achieved. Behaviours include competencies, skills, expertise and proficiencies, the adherence to organizational values, and the person’s personal style, manner and approach. Behaviors deal with how the person went about doing the job. 10. What are the Key Result Areas (KRAs)? Key Result Areas are broad areas to which an employee is expected to focus his or her efforts. 11. Under which MFO does each DepEd office fall? Objectives are specific things you need to do and the results you need to achieve is your Key Result Areas. 13. How many objectives should we write per KRA? Usually, from one to three objectives are sufficient to cover each Key Result Area. You have too many important results to focus on. You have several objectives that are less important and can be eliminated or incorporated into other objectives. 14. Who will set the KRAs and output of offices under the rationalized Region and Schools Divisions? The Change Management Team (CMT) provided copies of Region and Schools Division office functions with KRAs and outputs to the heads of office which will serve as a guide for the offices once transitioned into the new structure. 15. How do I write effective objectives? Define quantity, cost, timeliness, and/or quality as well as any due dates or time frames. Avoid writing “All or Nothing” objectives. Don’t mistake activities for objectives. Make sure it’s within your influence. Make sure it’s observable. The results of your efforts need to be evident to the people who provide you with feedback on your performance. Usually, one to three objectives are sufficient to cover each KRA. Ask yourself: Does this objective benefit me, my work group, and the organization? If not, consider rewriting it. 16. What are Performance Indicators? They are exact qualification of objectives. It is an assessment tool that gauges whether a performance is good or bad. However, even if we have all the information about the units, we will not be effective in managing our operation if our data interpreted correctly. 17. Why do the Rater and Ratee have to agree and reach agreement during the Planning Phase? Gaining employee commitment and cooperation towards reaching performance targets is a Critical Task for this phase. NOTE: At this stage, the Individual Performance Commitment and Review Form (IPCRF) must be signed by both the rater and the rate. 18. Can we change the adjectival rating in the Rating Scale? The Rating Scale is non-negotiable. This is mandated by the Civil Service Commission (CSC) for all government agencies. 19. How can we be objective when we evaluate someone’s performance? If the rates is “uninfluenced by emotions” or “personal prejudices” if he is “fair”, if he or she bases her assessment on “observable phenomena” like an employee’s performance and behaviour which are easily observed, and presents the appraisal factually, then that performance appraisal at the rater are indeed objective. But it’s easy to fall victim to the myth of quantifiability: the erroneous belief that in order for an evaluation to be objective, it must involve countable units. Objectivity has nothing to do with accountability. As long as the raters meet the following three tests, they are in fact objective evaluators. They have a clear model of excellence. They are trained and experienced. 20. What are our performance cycles in DepEd? January to December: Rater monitors and coaches Ratee. June to March: Rater monitors and coaches Ratee. 21. Following the RPMS Cycle for non-school based personnel, Phase I should have commenced in December 2015. How do we document performance if at this point we still have not accomplished the OPCRF and IPCRF? 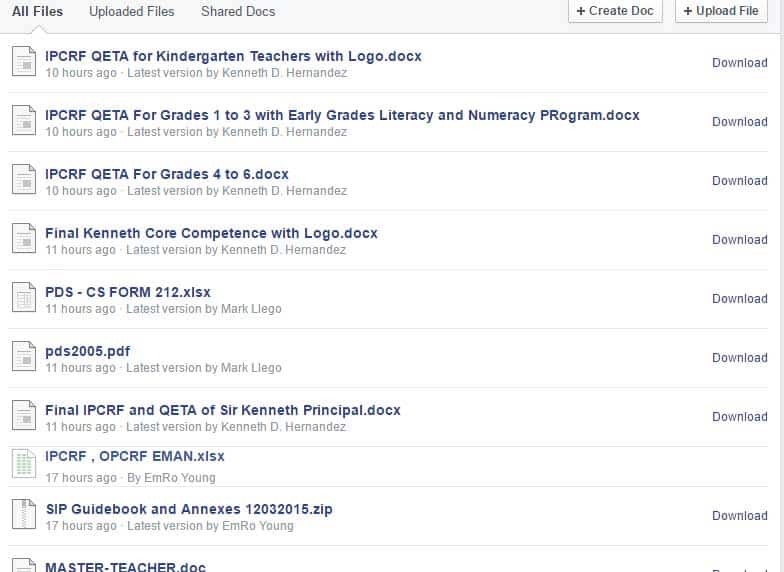 Capture actual accomplishments and outputs using the RPMS forms annexed to DepEd Order No. 2, s.2015 (Annex E & F). 22. For third level positions, do they still need to accomplish IPCRF? The act of observing over a period of time for the purpose of measuring performance. Keeping track, documenting output and behaviour. 24. Why is Monitoring important? 25. What are the common tracking sources used? 26. How do you track competencies? 27. How do you reduce subjectivity when monitoring performance? Establish clear and specific basis for assessment. 28. What is a good feedback? 29. When do you need coaching? After you’ve handed an important task and went to know how you did and how to improve. 30. How do I motivate employee to deliver good performance? 31. What is Performance Evaluation? A dialogue between leaders and employees aimed at improving future performance. It is a summary of performance feedback and coaching discussion done throughout the year. 32. What are the employees’ responsibilities in the performance evaluation phase? Review your personal performance over the year. Assess your performance and accomplishments against the plan. Prepare a list of your accomplishments and achievements and read it to your appraisal. Write a self-appraisal using the IPCRF. Consider any revisions needed to your key position responsibilities, goals, objectives, competencies, development plans for the next cycle. Prepare for the performance review meeting. 33. What are the manager’s responsibilities during the performance evaluation phase? Ensure tough minded, demanding performance standards are set. 34. How do you compute the rating? 35. In the sample given in DepEd Order, Plus Factor formed part of 100% KRAs. Will this mean that each employee should have Plus Factor KRA in order to attain 100%? What if the employee was not able to identify/given an area for Plus Factor? With or without Plus Factor, weight per KRA should total 100%. 36. Will the rating of Competencies for teachers be included in the final computation of RPMS rating? NO. Competencies rating shall serve as the basis for training and professional development and be included in the Part IV: Development Plans of the IPCRF for Teachers. 37. What may be considered as Plus Factor for non-school based personnel? 38. If an employee is transferred to a new office, what will be his/her new KRAs and Objectives? How will he/she be rated? Capture accomplishments and outputs in the previous office and make a new set of KRAs and Objectives under the new office where the employee was transferred. The current rater will determine the final rating at the end of the year, including the employee’s outputs and rating at his/her previous office. 39. How do you start writing a performance appraisal? What is the single most important message I want to communicate about the individual’s performance through the IPCRF? Most accurate rating category for each individual objective. o Most accurate narrative description. 40. How should I open the meeting during the Performance Review? Describe the meeting’s importance to you. Provide the overall time frame for the meeting. Tell the employee where you’d like to start. 41. How do I write development plans? The lowest rating or ratings in both achievement of results and demonstration of competencies becomes the basis for the development plans. Set goals for meeting these needs. Prepare action plans for meeting the needs. 42. Aside from classroom training, what other activities that can be considered for employee development? Can RPMS objectively evaluate teacher’s performance?What are the pro’s and con’s of RPMS?